Pain is your body’s way of telling you something is wrong. It may be confusing when your pain is in your abdomen, since many important organs are located in this area. Once the organ that is experiencing problems is isolated, it becomes easier to relieve the pain. 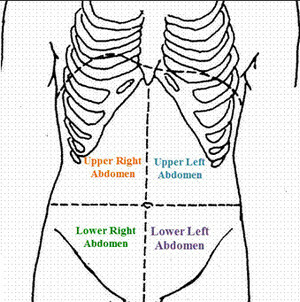 To make it easier to describe where your pain is located, the abdomen was divided into quadrants. They include the lower right, lower left, upper left and upper right quadrants. In this article, we will be focusing on pain in the right quadrants of the abdomen. In addition to right side pain, you may feel some pain on the left side as well, particularly since matching organs and structures on the left side are also affected. There are various factors that cause abdominal pain on the right side. It could be due to stress, trauma, food and drink or an underlying medical condition. Identification of the cause is the most important thing. You can’t get proper treatment unless the cause is known. Referred pain can be experienced in a part of the body other than where a problem lies. Organs may share common cavities where the nerves are together. Due to this, some pain can be more constant and less localized. Another cause of referred pain is the plethora of nerve signals that occur in the human body. Your brain can become confused by too much information arriving from the nerves. There isn’t a single definition why people feel referred pain, but it is believed that it affects people in different ways due to the many sensory stimuli under the skin, as well as the low number of sensory stimuli in the organs. When both of these stimuli converge on your spinal cord, you can feel referred pain. Liver problems are prime examples of referred pain. If you suffer from liver disease, you may actually feel pain not in your abdomen but in your neck! Another example of referred pain is shoulder pain. You can feel shoulder pain unrelated to the actual shoulder. It could be from medical conditions that involve liver, gastric ulcer and gallstone problems, or even a heart attack. Irritation in the peritoneal lining causes parietal pain in the abdomen. It can be debilitating since the abdomen has many nerve endings. 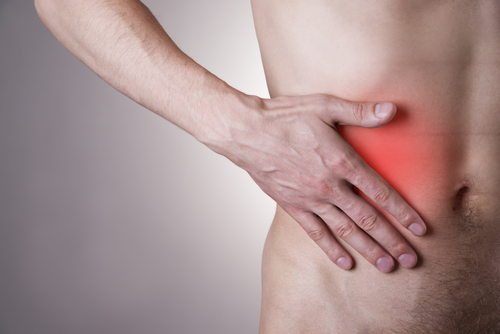 Pain directly involving abdominal organs causes visceral pain. Major organs do not normally have a great number of nerve fibers. Due to this, you may only experience dull pain. Visceral pain is poorly localized and usually the pain is mild. There are differing types of pain in the abdomen, meaning that the specific causes may be difficult to determine. The pain may radiate from several abdominal areas. The appendix is a 3.5-inch tube of tissue that frequently develops inflammation. No one knows precisely what the purpose of the appendix is, but this much is known: We function without it just fine, without any apparent consequences. If you have appendicitis, it is a medical emergency. Surgery must be promptly done to remove your appendix. If you do not have an inflamed appendix removed, it will perforate or burst, which causes it to spill infectious material into your abdominal cavity. These infectious materials may lead to peritonitis, a dangerous inflammation of the lining of the abdominal cavity (the peritoneum). This can be fatal if it is not quickly treated with strong antibiotics. At times, pus-filled abscesses form outside an inflamed appendix. Scar tissue will wall off your appendix from the remainder of your abdomen, preventing the spreading of infection. If an appendix is abscessed, it is less urgent, but surgery is required to identify this condition. So you’re looking at emergency surgery, either way. In the United States, one out of every 15 people will experience appendicitis. It can occur at any age, but it is most commonly found in people between 10 and 30 years old. The pain from a UTI may start in the urethra or bladder. Women have UTIs more often than men. If you have a UTI, you are also more likely to experience an urge to urinate, and pelvic pain. If your kidney is infected as well, the pain may radiate from the abdomen into the back, and you may experience chills. This is an inflammatory disease in the bowels. It affects the digestive tract lining. When this lining becomes inflamed, it results in abdominal discomfort and diarrhea. The inflammation may affect the tissue, and this can turn into a fatal health issue. 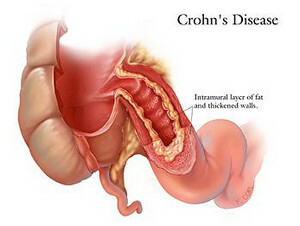 Crohn’s Disease may be a cause of pain in the right abdominal area. This condition causes the endometrium, normally found in the uterus, to grow in other areas, including the Fallopian tubes or ovaries. When this happens, the endometrial tissue becomes trapped and can cause pelvic pain during your monthly period. Right side abdominal pain may be caused by a number of conditions. Determining the exact cause can be confusing. The associated symptoms are studied carefully, to reach the correct diagnosis. Kidney stone pain is usually sudden and severe. It may spread into the groin and lower abdomen area. You may also feel nauseous and vomit when you feel this pain. This pain may begin slowly, and that is then followed by more severe pain. If you have appendicitis, you may also feel nauseous and vomit, and you may lose your appetite. Ovarian cysts can result in abdominal pain, especially during your menstrual cycle. Some cysts aren’t serious, but if they rupture, the resulting infection may be life threatening. Stomach ulcer pain can start in the upper quadrant, and can even spread to your chest. It is usually chronic and sharp. It may become worse if you’re not eating. If you’re a pregnant woman and you experience sudden pain in the right side of your abdomen (not normal cramps), it may then spread to your pelvis. Call your OB-Gyn or head to an emergency room right away. This type of pain is indicative of ectopic pregnancy. Right side abdominal pain is indicative of several disorders and diseases. The treatment followed will depend on the medical condition, and will focus on eliminating the reason for the pain and the pain itself. If kidney stones are the cause, your physician may prescribe you medications that will purge them. If stomach ulcers are causing your pain, you may take OTC antacids that will help in soothing the discomfort. To lessen pain, acetaminophen is usually recommended. Don’t take any pain medications with aspirin, as this can cause stomach irritation and even internal bleeding. If ectopic pregnancy is the cause of your pain, the “displaced fetus” must be surgically removed. Otherwise, this condition can become life threatening. Only your uterus can properly hold a growing fetus. If you are a woman and have ovarian cysts, they may require surgery, if they have ruptured. If your pain makes you suspect that you have appendicitis, treat it as an emergency and head to a local hospital quickly.